Parti Pribumi Bersatu Malaysia leaders Tun Dr Mahathir Mohamad and Tan Sri Muhyiddin Yassin have made anti-China assertions, such as blaming Chinese nationals for taking away the rice bowl of Malaysians, criticising the Government for compromising national sovereignty and claiming that 700,000 Chinese nationals would be made Malaysian citizens. My view is that they do not understand China’s “One Belt, One Road” (Obor) initiative. This severe lack of understanding on their part has led them to hold a warped and erroneous view of the initiative. Recently, during my visit to Hunan, China, the Ministry of Transport purchased a total of 22 trains from CRRC Zhuzhou Loco­motive. While our objective is to improve our public transportation’s overall efficiency, there is a bigger picture quietly in play here – reviving the majestic Silk Road. Contrary to popular belief, the Silk Road did not actually consist of a well-defined, real road that transported only silk. The ancient trading route, which at its peak stretched from China to Europe, was merely a series of connected “paths” in large patches of arid deserts and lofty mountainous areas, with commodities such as spices, porcelain, textiles and above all, silk, being traded. Considered one of the greatest trade routes in history, the Silk Road not only marked the first steps of globalisation, but also a vast sharing and appreciation of culture, arts and beliefs between the east and the west. Today, more than 60 countries around the world, including Malay­sia, are seeking to revive this ancient route, through the Obor initiative. This initiative, which aims to reshape global trade through massive infrastructure development, consists of two parts – the land-based “Silk Road Economic Belt” (the belt) and the ocean-based “Maritime Silk Road” (the road). "I am proud to say that Malaysia is already in the process of taking advantage of this initiative, through the implementation of two key Belt and Road initiatives. " The ambitious plan covers 30% of the world’s total land area and 64% of the global population, with a potential economic size of US$21 trillion (RM92.4 trillion). As Malaysia continues the journey to become a high-income na­tion, the Obor initiative will give us a tremendous advantage in the growing glo­bal competitive market, from an economic and trade standpoint. I am proud to say that Malaysia is already in the process of taking advantage of this initiative, through the implementation of two key Belt and Road initiatives. One of the key projects the Malaysian Government is participating in to align itself to the Obor “belt” initiative is the Singapore-Kunming Rail Link (SKRL). Also one of Asean’s flagship projects for raising the region’s connectivity, the SKRL is planned to connect China’s Yunnan province to Singapore via Malaysia, Thailand, Myanmar, Vietnam, Cambodia and Laos. As the permanent chair to the SKRL Working Group, Malaysia continues to lead discussions and negotiations for this project, which is expected to spur economic activity along the almost 7,000km rail line. For Malaysia, the SKRL is seen to open up local businesses to more opportunities for trade, investment, economic growth and jobs. This is one of the key drivers for our very own High Speed Rail (HSR) project that will connect Malaysia to Singapore, and vice versa. Currently, the line remains in progress with its various links in the countries involved being built or upgraded. At the same time, we are also working on a mega plan aimed at cementing Malaysia’s position in Obor’s “road” initiative. Located at the second most populated waterway in the world, the Malacca Straits, the Melaka Gate­way will see the reclamation of three islands to boost our position as a significant global trading port. Expected to be completed by 2025, the project is potentially the largest private marina in South-East Asia, with 12 precincts including resi­­dential, commercial, cultural, enter­­tainment and lifestyle elements. The Gateway will also consist of a deep sea port for cruise ships, especially Chinese vessels, which will boost our tourism sector. We can also expect local trade to improve, more maritime activities in the area and opportunities for port maintenance. Above all, the project anticipates future trade activities spurred by the Obor initiative. In 2015, the Malacca Straits recorded more than 80,000 ships passing through. With this figure expected to in­­crease by more than 40% in 2020, the Gateway is clearly a landmark we need to construct to­­day to secure our future opportunities. Big infrastructure projects aside, there are also significant efforts to build resilience and capacity among local Malaysian businesses. This is to ensure businesses are able to compete better in an ever-growing market. Take for example the “Port Alliance” between Malaysia and China – a programme covering six Malaysian and 11 Chinese ports, of which four are listed in the top 10 biggest ports in the world. It is aimed at promoting technology and knowledge transfer from the bigger ports to the local port industry on port technology, container processing and speeding up processes through less red tape. Xiamen University Malaysia, which recently opened its doors in Se­­pang, is another good example show­­casing knowledge transfer. The university, in collaboration with tech giant Huawei, is currently developing an Information and Commu­ni­ca­tions Technology-enabled campus to promote the transfer of the latest and best technologies to local students. 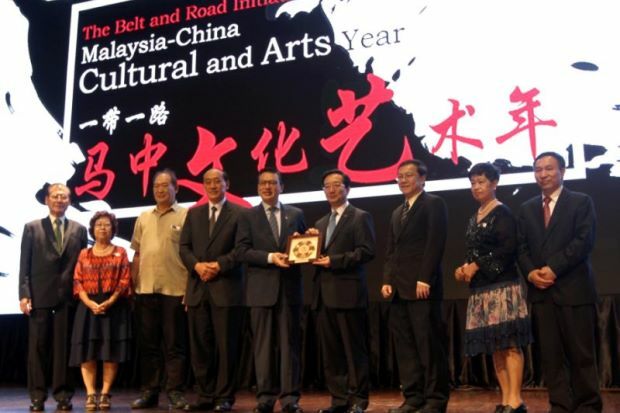 On the ground level, we have set up the MCA Belt and Road Centre (MBrace) at Wisma MCA, Kuala Lumpur, to educate local business on the Obor initiative and provide consulting and business matching services. The key goal is to ensure local businesses make the most out of the Obor initiative. We have also been diligently organising dialogue and meeting sessions such as the 2015 & 2016 Obor: China-Malaysia Business Dialogue in Beijing and Kuala Lumpur and our recent meet with one of the biggest shipping companies in Asia – China Cosco Shipping Corp, to ensure we are up-to-date with Obor’s latest developments. In May, our Prime Minister Datuk Seri Najib Tun Razak, at the invitation of the Chinese President Xi Jinping, will be leading a delegation to China to foster stronger ties and uncover mutual economic opportunities to build better growth for Malaysia into the Chinese market. As the nation continues on this transformation journey, we must take an optimistic approach and understand future strategic benefits of implementing initiatives such as Obor. Contrary to allegations that our current Obor projects will threaten and undermine national sovereignty or the beginning of a form of colonisation by China, I must stress that what we are doing today is not dissimilar to the “Look East” policy introduced in 1981 by Tun Dr Mahathir Mohamad. The difference is we are adding fiscal resilience to our continued desire to improve and sustain our future economic well-being. Instead of applying a personal political agenda on this matter, as leaders, we must look to the future and make far-sighted (and sometimes tough) decisions for the benefit and future of the country. The projects that we are currently embarking on are not white elephants, as criticised by some, but a powerful economic vehicle waiting to be unleashed to unlock Malaysia’s true potential. Datuk Seri Liow Tiong Lai is Minister of Transport Malaysia and MCA President. The views expressed here are entirely the writer’s own.